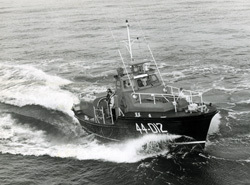 The RNLI introduced the Waveney class lifeboat into its fleet in 1962, Whitby's Waveney class lifeboat White Rose of Yorkshire served as the all weather lifeboat from 1974 to 1988. It was made possible by way of a gift of "Miss Gwynaeth Milburn" of Harrogate. 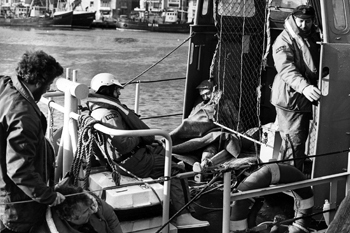 The lifeboat was purchased at a cost of £70,000 and was launched on service 239 times with 51 lives saved, whilst the relief lifeboats were launched 47 times saving 24 lives. 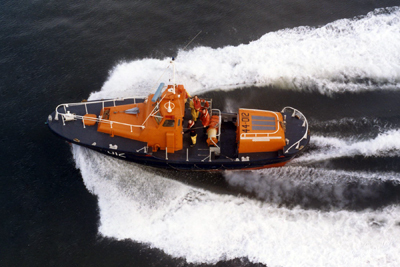 After leaving Whitby and the RNLI the White Rose of Yorkshire returned to its role as a lifeboat this time for the Roberts Bank Lifeboat Station as part of the Canadian Coast Guard Auxiliary - Pacific (CCGA-P). The CCGA-P includes over 1400 committed volunteers throughout the British Columbia providing search and rescue services. The Roberts Bank Lifeboat Station Society is also a volunteer, non profit, charitable marine Search and Rescue organization working with the Canadian Coast Guard Auxiliary Pacific. 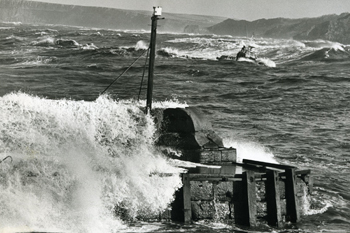 I have added two gallery pages of the boat in its Robert Banks role which can be accessed using the links below. 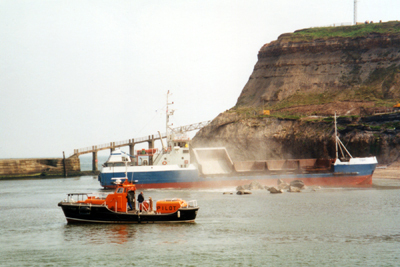 In a yet another strange twist the current Whitby pilot boat is also an ex Waveney class lifeboat itself, the photograph below shows the pilot boat in front of the stone carrier "TOPI". The large stone boulders were being used to try and hold back the cliff erosion. As if to date the photograph the Spa ladder was still place, a walkway that connected the east pier to the cliff, which was at times adventurous, unfortunately cliff erosion made this unsafe leading to its closure. The ladder has now been replaced by a permanent but somewhat uneven walkway, which I find extremely steep and therefore rather precarious. At the top of the photograph the television transmitter can just about be seen, the erosion that forced the closure of the "Spa Ladder" also eventually led to the transmitter being removed and relocated much further inland. This was not the ideal solution and has resulted in a complete lack of signal to probably over two thirds of the townsfolk, today the only way many can get any form of television reception is to have taken out a Sky subscription, even if they can't really afford it, so much for progress. Seeing the pilot boat move around the harbour is almost like seeing the "White Rose of Yorkshire. 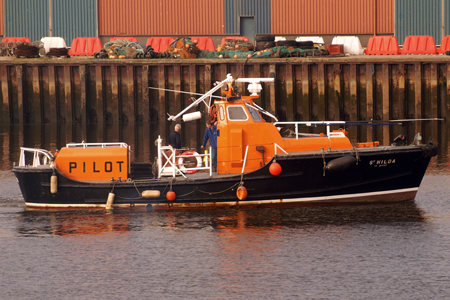 I wondered about the history of the pilot boat during her days as an lifeboat and contacted the RNLI. They were as ever really helpful and soon supplied me with significant information including its service history and I was extremely pleased with just how informative they were. I have made both of the files available here as either MS Excel format or the more common Adobe.pdf format, just use the links below. 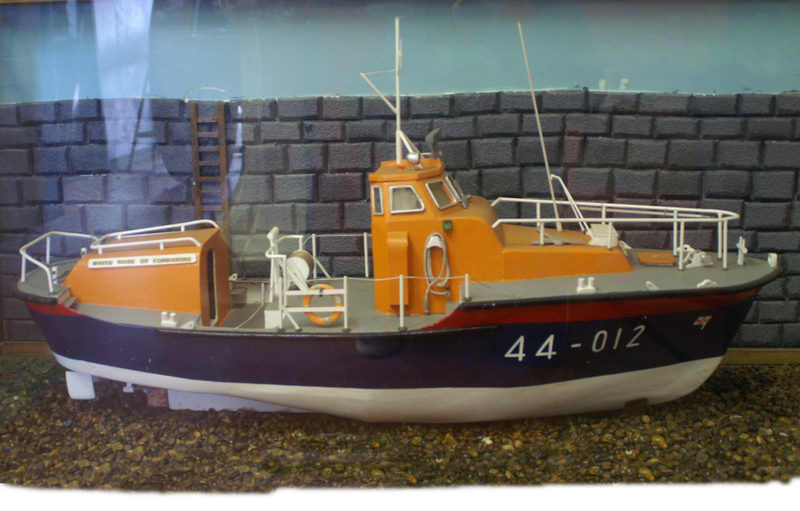 The Waveney class of life was an interesting class of lifeboat, they seemed so fragile with such a small upper structure, they were however very manoeuvrable and quick for their era. 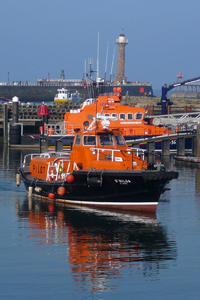 The link below takes you to a comprehensive website dedicated to 44' Motor Lifeboats and is well worth a visit it has many photographs of vessels like the White Rose of Yorkshire.